SF14 Session 8: Trauma and its effects on young people and those who care about them - TheMHS Learning Network Inc. Professor McGorry talked to us about how trauma is a risk factor for mental health disorders, and how, conversely, the experience of psychosis itself can be traumatic and function to perpetuate further mental health problems. Furthermore, reviewing research and elaborating on professional observations, he discussed how mental health services can perpetuate trauma and delay recovery. Finally, he discusses how mental health workers are frequently exposed to traumatising situations and conditions. He concludes with the importance of supporting mental health workers to prevent burnout and traumatisation. Professor McGorry’s interest in trauma began early in his career, and is one of the reasons he became involved in the mental health arena. He has worked with people presenting with psychosi,s and with asylum seekers, both experiences being associated with trauma. 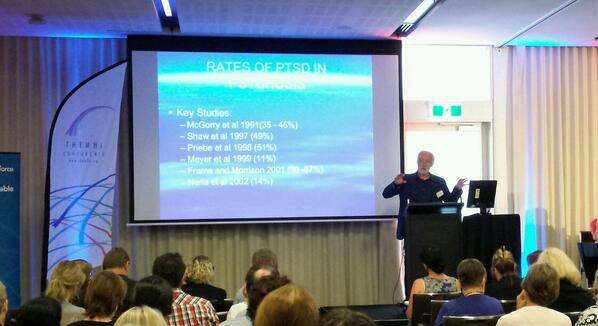 Trauma, he says, has been recognised as a risk factor for mental health. A large proportion of consumers have experienced trauma in their lives. For example, it is increasingly becoming apparent that trauma is a risk factor for schizophrenia. One study compared Vietnam veterans with PTSD to people with schizophrenia and revealed that both groups had the same level of negative symptoms, and many of the same symptoms of PTSD, such as a “shut-down” and withdrawal. Other observations have raised the question of negative symptoms associated with schizophrenia are a reaction to the trauma/stress related to psychosis. Despite this, at the present stage evidence-based treatment for trauma preceding schizophrenia is limited and reductionistic. Prof. McGorry emphasised that picking just one approach to psychosis, usually one emphasising either the experience of trauma or the condition’s biological underpinnings, is not sufficient. Rather, he states clinicians need to take a dual approach. Professor McGorry reviewed data from several studies showing how people who present with psychosis experience entering the mental health systems for the first time as traumatic. The psychiatric institutions are experienced as frightening to consumers, and the events can be re-experienced as nightmares and in the form of PSTD like symptoms. A study found that in up to 25% percent of cases, therapeutic response/care was experienced as traumatic, and includes the use of police/security and restraints such as handcuffs. In particular, a study found that in a cohort of 600 patients who presented with first episode psychosis, many had a significant history of physical and sexual abuse. Furthermore, these patients experienced delayed functioning, a higher risk of suicide attempts, and delays in getting treatment. violence. Up to 60% of non-fatal violence is in mental health care, this being three times higher than in general health care. Moreover, a lot of cases go unreported. Additionally, 80% of psychiatric nurses have been exposed to violence. learned helplessness. Professionals at all levels may feel that they cannot change things they know they need to change. normal communications between professional and consumer, particularly important when working with young people. He concludes his talk by saying that practitioners need to be more culturally minded and more flexible by going out and engaging with the client in their community, this in order to establish “the real relationship”. Unfortunately, the way many mental health institutions are structured today, with more rigid externally determined procedures, may prevent an organic response to a workplace trauma. Mental health services and professional need to become more community focused.